Trae Waynes took the NFL world by storm on Monday, posting his time of 4.31 in the 40 yard dash and immediately sending him up every fan’s draft board. But how good is Waynes on the field? Last year his running mate Darqueze Dennard was taken in the 1st round by the Cincinnati Bengals. Many have said that Waynes is better than Dennard was last season. With his excellent combine, many have propelled Waynes ahead of CB’s such as Marcus Peters. Let’s take a look at how good Waynes really is. He is a taller CB, so it is essential that he stays low. Waynes plays high sometimes and has trouble changing directions from time to time. In man-to-man coverage he grabs to much and relies on this to help him stay in good position. Waynes really excels in covering the deep ball, his size and speed combination as well as his ability to use his body to box out the WR, gives the WR almost no chance at making the catch. Although he’s good at the deep-ball, he sometimes struggles to find the ball. Though, this is a natural thing for most DB’s. He is a willing tackler, but he is only an average one. When tackling, he fails to bring his feet a lot of the time. This causes him to miss the tackle, or to get carried by the ball carrier on contact. He struggles to get off of blocks downfield, I feel this may change once he is the NFL and on their training program. When he plays trail technique, he is very good at mirroring the WR. This is evident in the many deep out routes that you will see. Waynes best trait is his ability to keep himself square at the line. He is not fooled by the WR’s shake at the line of scrimmage. Waynes makes the WR declare his way before opening his hips. Michigan St. plays a lot of man-to-man coverage, so we don’t see much zone from Waynes other than the occasional Cover 3 where Waynes is taught to bail and run. Game 1: Vs. #14 Ohio State. November 8, 2014. Ohio State stays away from Waynes for the most part in their game, attacking other parts of the field. Still, it is good to see how Waynes stacks up against the national champions. Ohio State possess a simple, yet deadly passing game with NFL caliber WR’s. As well as a dominant running game that the nation saw on full display in their playoff run. Game 2: At Penn State. November 29, 2014. This, in my opinion, is our best look we get at Waynes (without All-22). In this game we get to see how Waynes is attacked by NFL prospect QB Christian Hackenberg. Waynes is thrown at a lot in this game, as well as very involved in the running game. Game 3: Vs. #5 Baylor. January 1, 2015. We don’t see much from Waynes in this game due to Baylor being centralized on speed and quick throws, as well as Waynes being injured in the game. But we do get to see how Waynes responds to WR’s with elite speed and how he may match-up against burners in the NFL. This is the most impressive aspect of Waynes game, in my mind. Waynes is very good at using his size (big for a CB at 6’0″), as well as his straight line speed to get on top of the WR’s and cut them off not allowing them to make a play on the ball. In this section we will only see examples from the Penn State game, although I wish their was a bigger sample size, going against a QB like Hackenberg is a good measuring stick. Here we see a rare occasion where Michigan State is in a zone defense, Cover 3 to be precise. The CB’s play as if they’re in man-to-man coverage but as soon as the ball is snapped they bail and run. Waynes allows the WR to break his cushion once he is off screen in order to eliminate the back shoulder throw. You see as the ball is coming down, Waynes closes down on the WR and cuts him off, giving him no chance to make a play on the ball. On this play, we do see Waynes struggle a little bit with the issue I mentioned earlier: finding the ball while in the air. Off the line, Waynes stays square but since the WR is going vertical he immediately releases outside. Waynes must learn to look for the ball when he sees the WR look for the ball, while still covering him. He has great coverage but since the WR sees the ball he is able to make a play on it. Waynes is forced to grab the WR’s shoulder with his left arm. This play wasn’t flagged, but it should have been. This play is very similar to the last, except with a positive result. Waynes is inside the WR on this play, because of the wide split by the WR (there is no where for him to break out). Waynes does a good job of staying on the hip of the WR and once again he attempts to cut off the WR as the ball is in-coming, the proper technique. The WR, though, attempts to come back to the ball because he sees it before Waynes. Waynes looks back as the WR is about to time his jump. But as the WR makes contact with the ball, Waynes gets his hand in there to knock it free before ultimately showing good hand-eye coordination and catching the ball. A good play. When I mentioned “staying square” this is the perfect example to what I was referring to. This is Waynes biggest strength in my opinion, and we will see more of it later on as well. The WR is running a fade route, different than a vertical because the WR must set up his route by stemming to the inside. Had Waynes broken and opened his hips to cover the inside route, he would have been beaten badly. But as the WR shakes and bakes, Waynes stays perfectly square until the WR commits to the fade route. Once into the route, Waynes does a nice job of using his body to get on top of the WR and not even give him a chance at making the catch. With Waynes being a tall, lanky CB, he must be prepared to sink his hips and break down to make the tackle. He often forgets to bring his feet when tackling which gives him problems. On a positive note, I did not notice Waynes shying away from the run game as some CB’s have done in the past so correcting his technique should allow him to become a capable contributor in the run game in the future. Here we see Waynes against the powerful Ohio State running game. The WR aligned head-up on him goes to block the safety, leaving Waynes as the unblocked defender in the running game. Waynes recognizes this and we see him begin to attack the ball carrier. As he closes in, the ball carrier angles up-field, a little out of Waynes way. Instead of bringing his feet and driving through the ball carrier, Waynes dives at the ball carriers feet, missing the tackle and allowing a big gain. On this play we see an example of Waynes playing high, although natural for his size, this must be tweaked in the NFL. Once again the head-up WR goes away from him to block the safety and Waynes is the unblocked man in the running game. Waynes begins to settle his hips once he realizes the RB is breaking to his outside, but it is too late. Waynes still has to settle his hips and change directions completely while the RB is moving full speed at him. The ball carrier gets around Waynes and to the outside of him, giving up a huge gain. With no WR’s being on Waynes side of the field, he bumps into the box almost as a weakside LB. Waynes first job is the jet sweep, which is faked. After Waynes clears the jet motion his job is to be the outside piece on the running game. Waynes does a good job of stepping up into the run game. But instead of driving through the tackle, Waynes uses his shoulder and doesn’t wrap up the ball carrier. It is a good play but it would be nice to see Waynes wrap up and finish the tackle. Similar to the last play, this time the WR on Waynes side of the field is the jet motion man. Waynes goes with the motion while the LB’s bump over with the motion, Waynes becomes the WLB once again. We see good physicality from Waynes here on this play. I would like to see Waynes get lower than the ball carrier on this play and then be able to drive the ball carrier back. Instead Waynes hits the ball carrier high and struggles to keep the ball carrier from gaining yards after contact. Although, Waynes doesn’t drive the ball carrier back, he does a good job of hitting the ball carrier and running his feet and finishing the tackle. 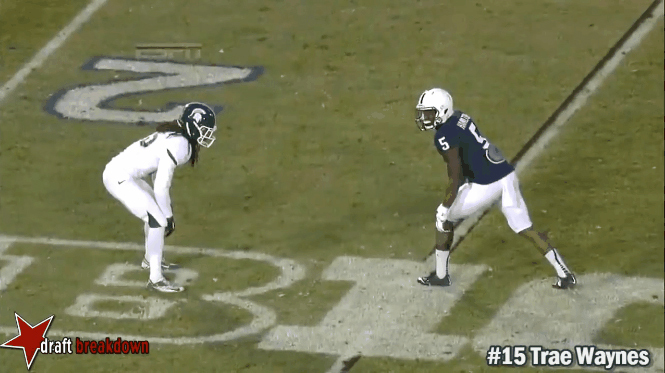 Once again a jet motion play from Penn State and Waynes coming into the box for the Spartans. Waynes is the unblocked defender in the running game, meaning he is left to make the tackle. Waynes doesn’t hesitate and closes down the running lane. He does a nice job of shuffling his feet all the way until he makes contact (unlike in the first play). This allows Waynes to get enough of the RB to bring him down for a gain of less than 1. Good play. Article continues on next page.